OKI Data Americas was front and center at the “Keep AG Wired” AlphaGraphics National Conference held in Austin, Texas on August 2-4, 2018. Arthur Verwey, Senior Product Marketing Manager for OKI, represented the Company at this event and shared that the two-day conference was extremely well organized and packed with educational sessions and networking opportunities. Verwey spent his time speaking with current customers but also investigating opportunities for franchisee locations to add OKI’s product line to their current print operation. Verwey demonstrated the unique capabilities of the C942dn/DP+ digital printer system, noting that this device can print CMYK and WHITE all in ONE pass on virtually any envelope size and accommodate media up to 13W x52”L-which makes the OKI an ideal solution for 6 or 8-panel brochures as well as long banners. AlphaGraphics owners even mentioned that most print shops in this industry can print full-color graphics, but also recognized that OKI is the manufacturer that can competitively deliver full-color plus white toner output, making OKI a true enigma in the marketplace. The OKI proC942 print solution delivers brilliant white toner on colored media or color-on-color with white underneath – making white images and text appear even more vibrant. Show participants marveled at OKI’s capabilities and were very impressed with the samples that were printed while they watched the C942 in action! Dave Jackson, Owner of AlphaGraphics Cherry Hill (NJ) is a testament to the C942 DP+ printer system as he purchased the device over a year ago. Jackson was excited to share his experience with his colleagues and fellow-franchisees, further explaining that he recently printed 10,000 units on dark blue envelopes, integrating a multi-colored logo and white text. His customer absolutely loved the output and was confident his direct mail would stand out from the pile of plain, white envelopes that everyone usually receives. Jackson also mentioned that the OKI comes with 3-year onsite warranty – a key feature that no other manufacturer currently offers and one that gives him peace-of-mind and confidence that he’ll always be up and running – 24 hours a day – every day! 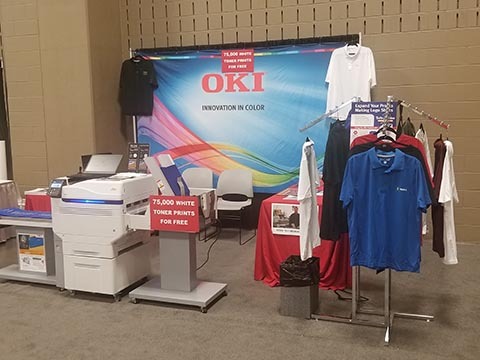 Visitors at the OKI booth also witnessed OKI’s Digital Transfer technology, seeing how effortlessly the OKI pro8432WT creates flawless heat transfers which results in high-quality, text and graphics on t-shirts and other garments, apparel and hard goods. OKI’s Digital Transfer solution is the best in its class as it utilizes CMY + White Toner to produce the most vibrant colored transfers ever. These transfers can be used on light or dark garments, using 100% cotton to 100% polyester (and everything in between) with virtually no limitations. With OKI’s pro8432WT Digital Transfer Printer, AlphaGraphics franchisees can easily and affordably add this technology to their printer fleet – and immediately start producing personalized clothing, mugs, cell phone covers, tiles – virtually any durable, hard good that you can image – the OKI 8432WT can accommodate.